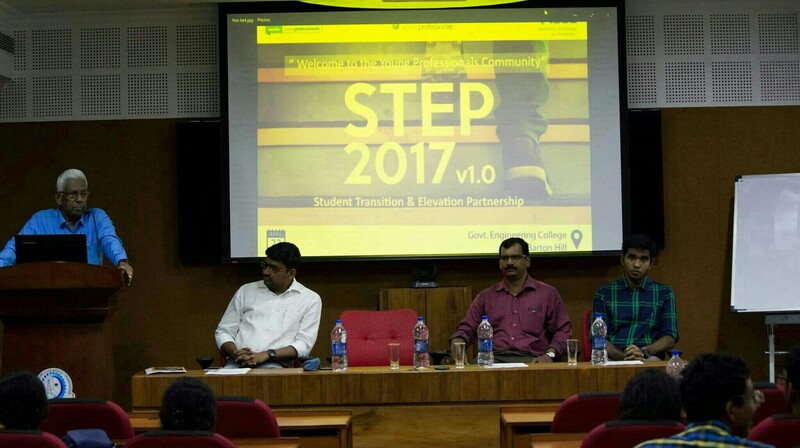 IEEE Kerala Young Professionals Affinity Group in association with IEEE Student Branch of Government Engineering College, Barton Hill, Thiruvananthapuram conducted STEP 2017 v1.0 (Student Transition & Elevation Partnership) on 22nd April 2017. It was a well-organized event which aimed at bringing together IEEE members graduating in 2017. The one day event began with Mr. Jishnu Krishna, Volunteer IEEE Kerala Young Professionals, leading the gathering through the IEEE Code of Ethics. Mr. Abey, Coordinator STEP welcomed the gathering to the event. Mr.Shahim Baker, Chairman, IEEE Kerala Young Professionals presided over the inaugural ceremony. Prof. V.K. Damodaran, Advisor, IEEE Kerala Young Professionals, inaugurated the ceremony and addressed the gathering about the importance of IEEE, when engineering students transform into professionals. He explained about various societies which can contribute to the technical knowledge in one’s career. In his speech, he also mentioned that IEEE Kerala Young Professionals group had won almost all the awards that a young professional affinity group can receive, which itself is symbolic of how vibrant the young professional community in Kerala is. Further he explained how IEEE can contribute to various global scenarios like 5G, climate change and so on. He also assured the participants that continuing with IEEE will definitely be beneficial for the young professionals as it is all about passion and satisfaction. Mr Biju, Branch Counsellor IEEE GEC, BH SB reminisced about his experience as an IEEE member in Barton Hill College. Then Mr. Adithya, Student Branch Chair, expressed his joy to host the event at GEC Barton Hill.The inaugural ceremony was concluded by Mr. Ashwin Raj, event head of STEP 2017 v1.0 delivering the vote of thanks. The event witnessed an overall participation of 18 student members from various student branches across Kerala Section. The first session was handled by Mr. Paul Ansel, Secretary IEEE Kochi Subsection. He spoke to the audience on “Self Mentoring” and its importance in one’s life. The importance of having a coach and a mentor to guide us, was well explained in the session. He also pointed out the fact that failure is just a stepping stone to success and though life may make us confront failure multiple times, the real victory is yet in rising up and moving ahead. Throughout the session, he inspired the participants to pick themselves up and build their confidence to go forward in life and be successful. The session was very interactive and highly motivating. He transpired to the students the skill of team playing through multiple activities. The next session was on “Support for Startups in Kerala” by Mr. Shahul Hameed, Secretary, IEEE Kerala Young Professionals. He explained about various startup missions undertaken by Govt. of Kerala. He also explained about different stages like preincubation, incubation and acceleration. He advised the budding entrepreneurs about the importance of having domain knowledge or experience in leading a startup. Various investment processes, Youth entrepreneurship development programmes and organizations involved in supporting these startups viz. TIE Kerala chapter, Headstart Foundation, IEEE Young Professional entrepreneurship group were also discussed. Post lunch the event resumed with a session by Mr. Bibin Parukoor Thomas, Vice Chair, IEEE Kerala Young Professionals on ”Journey ahead with Young Professionals”. He gave insights on areas like networking, technical assistance, personal development provided by the Young Professional community of IEEE. He also shared his own experience with the IEEE Young Professionals community. 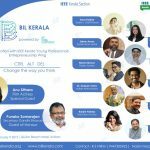 He welcomed the upcoming Young Professionals and assured them that the IEEE Kerala Young Professionals group will try to support new members in every way they can. This was followed by a panel discussion of five experienced professionals – Mr. Jithin Krishnan, Mr. Nandan S, Mr. Bibin Parukoor Thomas, Mr Shahul Hameed and Mr. Shahim Baker. Any queries regarding research was dealt by Mr. Jithin and academic related topics by Mr. Nandan S. Since panelists with multiple areas of expertise were brought together, the questions related to industry, academia and startups were addressed which in turn led to a fruitful discussion. Several questions also came up regarding the areas of higher education as well as the importance of industrial experience in teaching profession. The event came to a conclusion with the valedictory note by Mr. Shahul Hameed and photo session.